The man who attacked Aston Villa star Jack Grealish has been charged by police and will face court on Tuesday (AEDT). 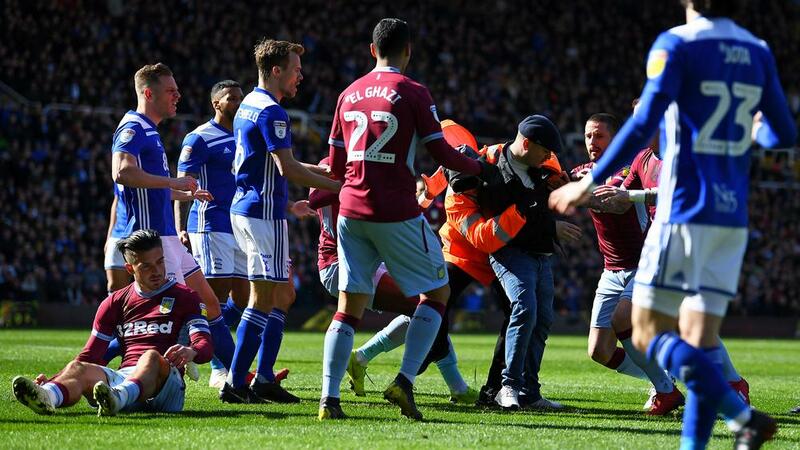 Villa captain Grealish was punched from behind by a pitch invader in the early stages of Monday's (AEDT) derby against Birmingham City. West Midlands Police confirmed Paul Mitchell, 27, had been charged with "invading the pitch and assaulting" Grealish. "We've this evening [Sun 10 March] charged a man with invading the pitch and assaulting Aston Villa player Jack Grealish during the Second City derby," it said in a statement on Twitter. "Paul Mitchell, aged 27, of Rubery, has been remanded in custody to appear before Birmingham Magistrates Court tomorrow [Mon 11 March]." Birmingham City had earlier announced the supporter would be banned for life. Grealish showed no ill effects from the incident and went on to score the only goal in his side's 1-0 victory before leaping over the advertising hoarding to celebrate with the away supporters. The police made four arrests in total for suspected assault or violent disorder offences.